For the past two months, I've been writing about Lane's brigade and the battle of Chancellorsville for two different destinations. The first treatment was the chapter for the Branch-Lane book. The second was an article, possibly for inclusion in a new issue of Civil War Regiments, about how James H. Lane wrote about the battle. The chapter in the Branch-Lane book is about 10,000 words. It is my belief that this will be the most widely read and scrutinized chapter of the book. Why? Well, it was Lane's brigade that shot Jackson. This episode of the war is one upon which a lot of ink has been spilt, possibly only second to the battle of Gettysburg. Even after such an exhaustive study, I still have a few questions. Both the 7th and 37th Regiments voted to bestow upon a member of each company the "Badge of Honor." Would it not be great to know why their comrades picked each of these men? Just what did they do during the battle to earn this honor? There were a couple of men who were promoted to a high rank on the field, men such as William Lee of the 7th NC. He was promoted to lieutenant colonel. Did this really happen on the field, or, did his promotion date to May 3, 1863? And lastly, John Crayton , 28th NC, was killed in action. According to the Troops book series, "a medal was presented to his friends for his bravery." I wonder what it looked like, how many were struck, who were his friends? The article I sent to Civil War Regiment takes a little different tack. Instead of looking at the role of Lane's brigade at the battle, I examined the way Lane wrote about the battle, starting with his official report, and then moving into the post-war years. He wrote a couple of newspaper articles about the role of his brigade, and corresponded with Henry B. McClellan, biographer of JEB Stuart, and with Augustus C. Hamlin, a Federal veteran who wrote a history of the battle of Chancellorsville. Lane's timeline of events never really strayed from his official report. 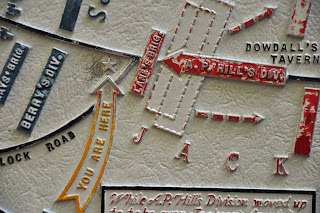 He did, though, as time went on, add little details, like his conversation with Jackson on the Orange Plank Road, about the topography surrounding him, and about how dark it was.
" The woods were on fire, shells, dropped loaded muskets & cartridges were exploding in every direction. The dead, Confederates as well as Federals, were on fire, & helpless wounded Federals-officers & men-begged to be removed from the approaching devouring flames but we could render no assistance. On reaching Colquitt, we had to wait until the woods on his left was burnt over, before we could prolong his line. There we remained until the next day in the ashes & the charred scrubby oaks, & it was hard to tell whether we white or black, Federal or Confederate so far as the color of our clothes were concerned. When we were ordered back, the troops in rear received us with boisterous laughter & cheer. My brigade was in nearly every great battle fought by the Army of Northern Virginia, but in none did I ever witness so many harrowing scenes as I did at Chancellorsville." No matter how many times I get to explore some of these topics, there is always some new angle to study, some new direction to consider, and big pile of questions I would love to have answered. I have written in the past about a set of missing flags from the Branch-Lane brigade. I understand missing a flag or two from a regiment, but five whole flags from a brigade issue? It would appear that right before the Seven Days campaign began, in late June 1862, Branch's brigade was issued new battle flags. 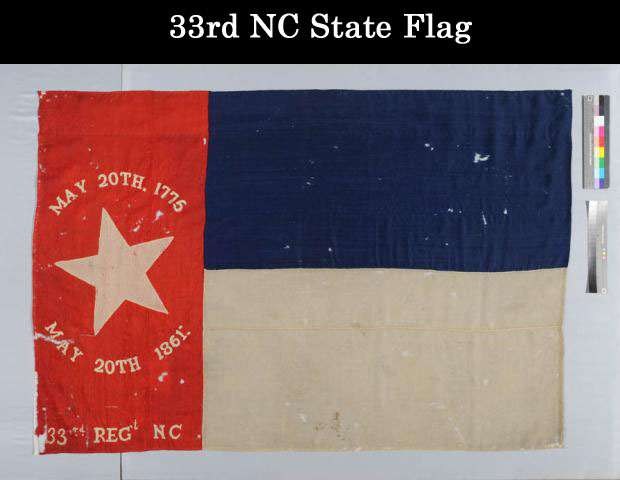 Nicholas Gibbon chronicles in his diary that the brigade received new flags on June 26, 1862. 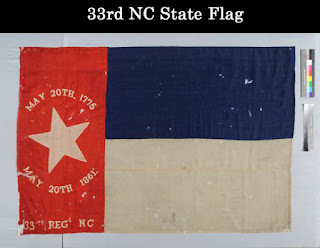 At the battle of Gaines Mill, the flag of the Seventh North Carolina passed through the hands of five color bearers, including Col. Reuben Campbell, who died with it in his hands. In fact, I have probably a half dozen mentions of various regiments in the brigade and their flags prior to the famous issue that is so associated with the Branch-Lane brigade. And I found another one last night. According to an article in the Weekly State Journal, dated October 1, 1862, Branch's "body, as he himself would have wished it, was borne to its last resting place under the tattered and ball-riddled flags of two of his veteran regiments." I would assume that the brigade sent two flags to accompany the remains of Branch. I would assume that one of them belonged to the Thirty-third, seeing that Branch was the former colonel of that regiment. But, what flags were they? 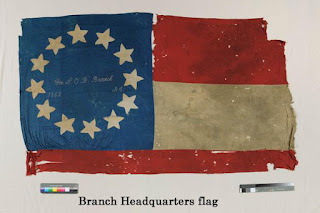 Devereaux D. Cannon, Jr., writes that the Richmond Clothing Depot was established in late 1861 and by May 1862, was making wool bunting flags from material captured at the former Federal navy yard near Norfolk, Virginia. These flags, according to Howard Madaus, featured 13 stars and "substituted orange wool for the borders." The flags were 48 inches square. 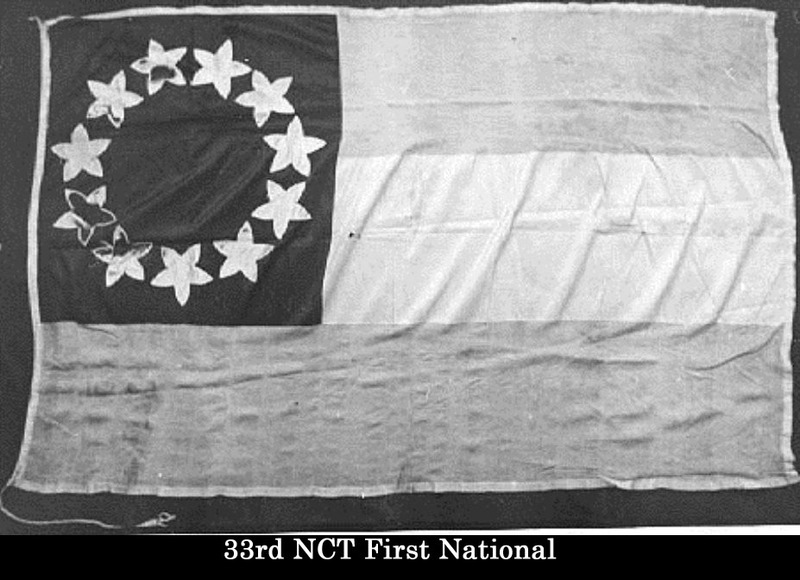 (see more here) "The first examples of these new battle flags were issued in May to troops of Gen. James Longstreet's Right Wing." 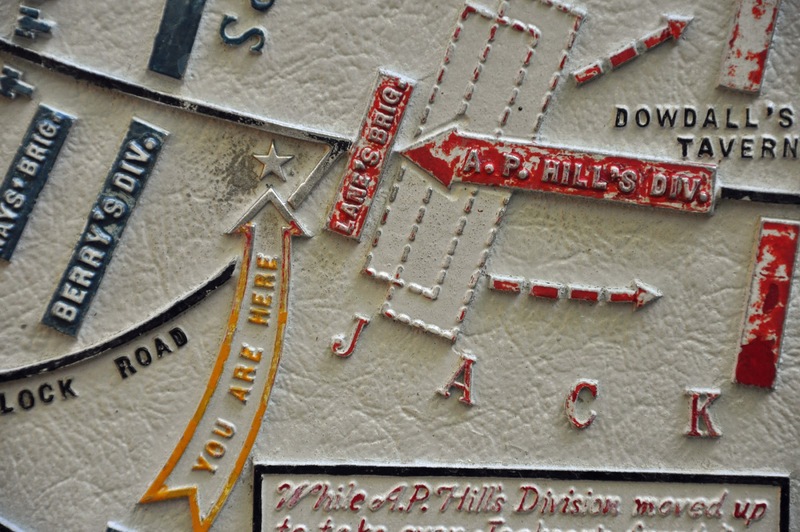 A. P. Hill's division was a part of that right wing until Hill and Longstreet had a falling out and Hill was transferred to Jackson's command. So my next question is this: are there surviving examples of first bunting issue flags for other regiments in Hill's Division? I've not found any.